Damn deadpan funny. But was it sarcastic as well? Did McCann also imply that criticism often lacks a feeling of responsibility? Jazz was a tough way of making a living and bad press could hurt business considerably. At least a few of the legends expressed this opinion, notably in drummer Art Taylor’s revealing book of interviews, Notes And Tones. The dislike of the ‘subjective criticism’ of one man is understandable. But on the other hand: hey, it was their livelihood as well, you know. Lest we forget, a lot of musicians themselves weren’t shy to comment on the efforts of their colleagues in Leonard Feather’s famous Downbeat section, the Blindfold Test. 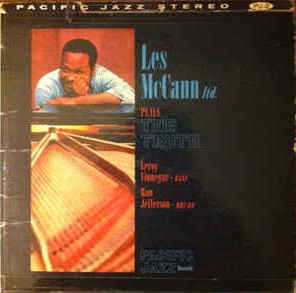 At any rate, downplaying Les McCann as a bluesy cocktail pianist was rather pointless. Let’s take a look at Plays The Truth, McCann’s debut album for Pacific Jazz. Evidently, McCann is a tunesmith of catchy compositions grounded in church life and Afro-American culture. Two of them on Plays The Truth are impossible to get out of your head and why would you want to? A Little 7/8 For God & Co is a delightful melody that’s attuned to a merrily bouncing rhythm. It swings heavily in the middle section, courtesy of drummer Ron Jefferson, walkin’ bass master Leroy Vinegar and McCann himself, who couples a firm left hand with boogiewoogie-infested right hand lines. The trio brings to mind the effortless swing of Oscar Peterson’s classic outfit including Ray Brown and Ed Thigpen. The tacky and irresistable, uptempo Fish This Week, reminiscent of those nifty and funky Ray Bryant tunes, evokes the luscious laughter and frivolous chit chat of a saturday night fish fry. McCann builds an articulate, ferocious solo of rollicking lines all over the keyboard, bringing to mind iconic masterminds like Teddy Wilson and Earl Hines. His ballad renditions – I’ll Remember April and This Can’t Be Love – are typified by sentimental intro’s and hard driving middle sections. There is enough uptempo, blues-drenched soul jazz on this album to rock more than a few joints, so a cautious use of blues playing and a constraint on the formulaic loud/soft-dynamics in these ballads would’ve benefited the overall picture. Obviously, Plays The Truth reveals a hard-swinging player without any strong ideas about comprising a coherent LP. Title track The Truth is a variation on slow blues song Trouble In Mind. It’s alluring after hours-music. McCann’s move into a faster tempo after four beguiling, slow dragging minutes comes across as a rather superfluous device. A dedication to his friend, pianist Carl Perkins (a Miles Davis favorite), For Carl Perkins, is a very satisfactory blend of fat, sustained chords and uplifting trio interplay. Stop-time theme Vacushna includes the surprise of a change of key and swings like mad. McCann, typically, puts the groove into these kind of affairs from note one. An exciting trio player, arguably McCann’s even better in the company of reeds, brass or organ, settings that called for concise solo’s and which highlighted his sprightly accompanying gifts. Cases in point: Live in New York including Stanley Turrentine and Blue Mitchell, Richard “Groove” Holmes’ Something Special, the Jazz Crusaders and Les McCann cooperation Jazz Waltz and Stanley Turrentine’s That’s Where It’s At. In 1969, McCann succesfully crossed over with the jazz funk cooperation with saxophonist Eddie Harris, Swiss Movement, spawning the Billboard chart hit Compared To What. (which also was recorded by McCann “discovery” Roberta Flack the same year) The following decades, McCann essentially sustained his formula of a ‘jazzified’ r&b and soul player and singer. A whole different ballgame. Since the late 00’s, the 81-year old McCann has kept a low profile, only occasionally performing with saxophonist Javon Jackson. Jazz isn’t worth a penny without blues and gospel. And the sixties-era Les McCann is a blues and gospel player at heart, a preacher, communicator, entertainer. For an illustration of the way McCann captivated audiences, watch this incredible live footage from McCann’s tour in France in 1961.